SoftwareSerial Library, DO NOT USE. NewSoftSerial works much better. The hardware UART Serial port should always be used, if possible, before considering SoftwareSerial. On Teensy, the hardware UART serial port completely separate from the USB port. On Arduino boards, the main hardware serial port is used for programming and sending messages to the Arduino Serial Monitor. Many projects and website may advise you to use SoftwareSerial or NewSoftSerial to communicate with serial devices, like GPS modules or Modbus controllers. This is necessary on Arduino Uno, because there is no unused hardware UART serial port. Teensy does have a hardware UART serial port available. Using the real hardware UART serial port provides much better performance and avoids SoftwareSerial's many issues. The old, buggy SoftwareSerial was replaced by Mikal Hart's NewSoftSerial in Arduino 1.0. However, NewSoftSerial was renamed to SoftwareSerial. Please refer to the NewSoftSerial page for use with Arduino 1.0. 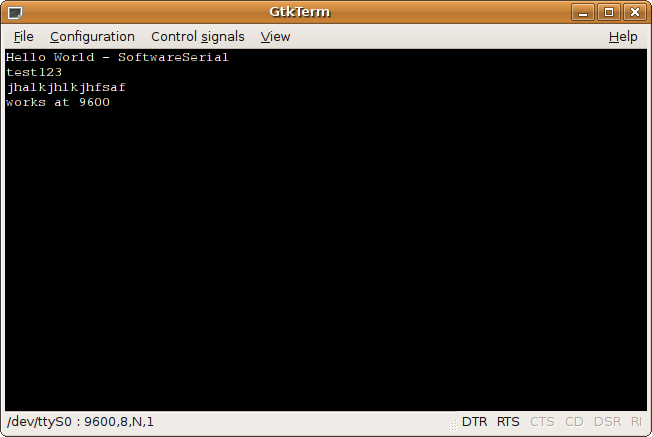 Prior to Arduino 1.0, SoftwareSerial does not handle interrupts properly. Any interrupts, from the normal timer0 (used for millis, delay, micros) to any other libraries in use, can cause corrupted data. SoftwareSerial has poor timing, with incorrect hard-coded assumptions about the speed of digitalWrite. On Teensy, the maximum working baud rate is 19200. SoftwareSerial does not support available(), and can only receive data when read() is called, which severly limits its usefulness for many applications. If you do use SoftwareSerial, the transmit pin is not set to output mode automatically. You must use pinMode to set it. NewSoftSerial corrects the problems present in SoftwareSerial. If you must must emulate a serial port using Arduino 0022 or 0023, use NewSoftSerial. and sends it out again on txPin. For more details, please refer to the official SoftwareSerial page.